Have you ever seen a lion at the circus, obeying his master’s every command? His trainer feels brave when he cracks the whip. But in a split second, the lion’s ear-piercing roar sends chills down the onlookers’ backs, reminding everyone who is really in charge. The king of the jungle is fast and brave. He quietly stalks his prey, waiting for the right moment to pounce and attack. His powerful, angry roar announces that he is a beast to be feared and no one is safe in the lion’s presence. But what if this savage beast was on your side? Could there be safety beneath those powerful paws? This is Jesus, the Lion of Judah. The first mention in the Bible of this lion who will rule is in Genesis 49:9-10, when Jacob speaks his dying blessing to each of his twelve sons. 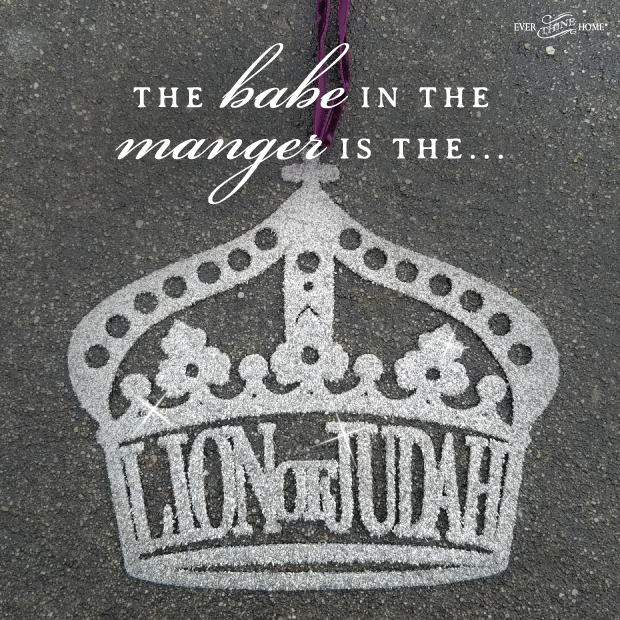 To Judah he says, “Judah is a lion’s cub; The scepter shall not depart from Judah….” A scepter is a rod often made of gold and encrusted with jewels, which a king extends toward anyone seeking his favor or blessing. It is a symbol of kingship, a symbol of his authority over every person in his realm. Jacob predicts Judah’s coming royalty. But Jacob’s words to Judah were not for him alone. After he spoke of the scepter, Jacob hinted about a future descendant: “…..nor the ruler’s staff from between his feet, until tribute comes to him; and to him shall be the obedience of the peoples.” One day a son many generations future will receive the tribute of nations and the obedience of all people. It was a prediction both of David’s reign and the greater kingdom of Christ. Leaving Genesis and skipping to Revelation, the Lion of Judah appears in John’s vision of the end times. Peering into heaven John sees a sealed scroll in the right hand of God, but no one can answer the angel’s call to open it. John begins to weep because no one was worthy. Then one of the elders spoke, “Weep no more; behold, the Lion of the tribe of Judah the Root of David, has conquered so that He can open the scroll and its seven seals”(Revelation 5:5). Jesus, the Lion of Judah, the majestic powerful fearless one, has conquered sin and death, therefore He is qualified. He alone is worthy. As Jesus steps forward to take the scroll and open it He appears as a Lamb. All in heaven fall prostrate before Him. With great power, influence, and authority, Jesus acts on behalf of His children. He is fierce and frightening, fighting against the devil’s schemes. He lies low in the grass, waiting to ambush our enemy, His prey, and rescue us at just the right time. What comfort we find in knowing the swift, patient, and proud Lion of Judah, the king of the world, is ferocious for us.